Nutritionists report that juicing is not a substitute for including fresh fruits and vegetables unless you put the ‘pulp’ back into the juice. After juicing, we feed our leftover pulp to the wildlife on our property (birds, squirrels, dozens of rabbits, and sadly, even our large gopher population). If we begin feeding our tilapia the pulp when their still babies (fingerlings), they’ll develop a taste for it too, but it we don’t start them out on pulp, they won’t eat it once they are several weeks old. 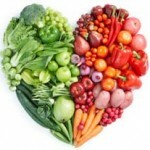 Again, back to the wise advice of nutritionists who suggest including at least two whole fruits and three to four fresh vegetables of different colors (which offer different minerals and vitamins) into our diets every day as a goal for health and even weight management. 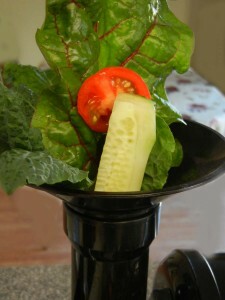 Owning a Portable Farms® Aquaponics System that is only steps away from our kitchen is an ideal way to harvest perfectly ripe and organic vegetables for eating raw or for steaming (we own large electric steamers that very fast are easy to use) and we also enjoy juicing whenever the mood strikes us. We love nothing more than sharing a variety of fresh juices with friends and family when they drop by instead of serving coffee or iced tea. 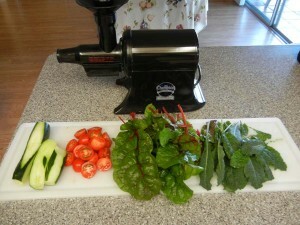 Fresh juice is a healthy pick-me-up and juicing is a great family activity. 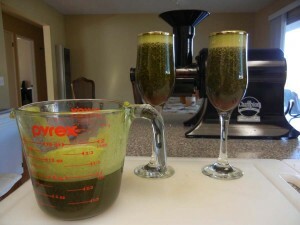 It’s Sunday morning and this morning we had the time to photograph the steps involved in juicing to show you how easy and ultimately, how delicious it is. For this juice recipe, we’ve included freshly harvested vegetables from our own Portable Farms® (left to right) cucumbers, cherry tomatoes, fresh baby kale and fresh baby Swiss chard. skin of cucumbers because the rind is high in nutrition. 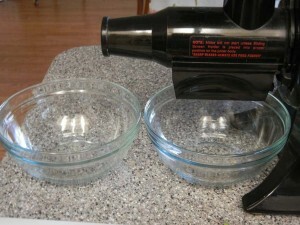 We put one glass bowl under the center of the juicer to capture the juice from the extraction process and one glass bowl at the end of juicer to capture the pulp from the vegetables. We feed the pulp to the many birds and animals who live on our property. If we have carrots or apples left over, I’ll occasionally make carrot cake or muffins with the leftover pulp to give to friends or those who come to tour our farms. We simple drop the vegetables into the juicer (push them down into the shoot with a small plunger) to run them through the extractor. 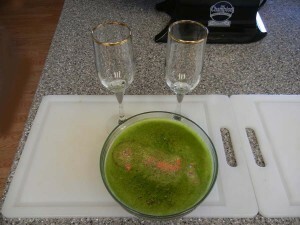 This is a photo from the freshly extracted juice and pulp from the vegetables. 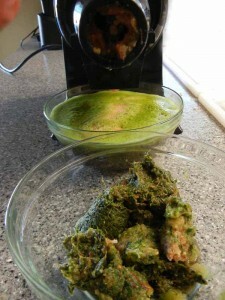 The juicing process itself takes less than five minutes. 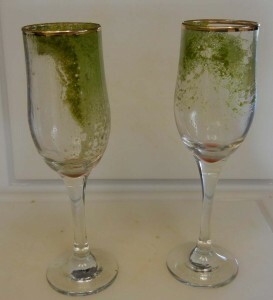 We take our juicing as a special event and always serve it in pretty wine glasses. Each of these wine glasses holds one-half cup of juice which is generally enough for us to juice each time. 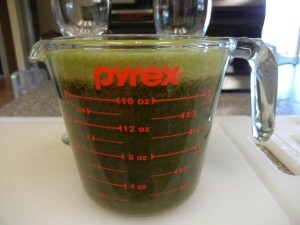 As you can see, these vegetables created a little over two cups of fresh juice. I’ll use the rest of the juice in a nutritious soup for lunch today. As you can see, there is about one cup left after filling our glasses. 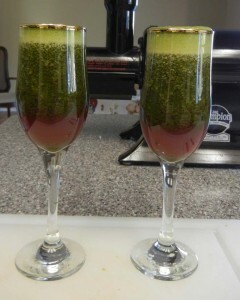 See how the Swiss chard (red) juice has settled to the bottom of the glass. 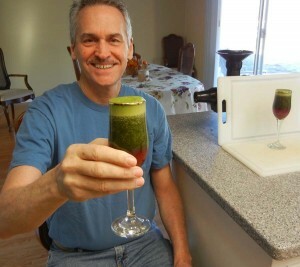 The ‘foam’ on top is from the vigorous activity of juicing which is light and very refreshing! Colle Davis, Lead Inventor for Portable Farms® Aquaponics Systems toasting ALL OF YOU today and wishing you health and happiness. CHEERS! This tells the rest of the story. 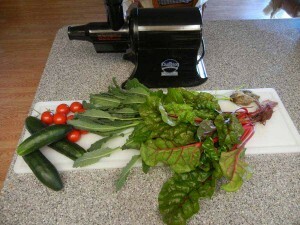 Delicious and healthy and one of the great joys for owning your own Portable Farm! As the Buddhist expression says, “First ecstasy and then the laundry.” So it goes; now I get to wash the juicer (not my favorite thing to do in the world), but it’s part of life.